Near this site, July 12, 1859, Nebraska Territorial Militia and U. S. Army Dragoons, totaling 300 men, under the joint command of General John Milton Thayer and Lieutenant Beverly Holcombe Robertson, prepared to attack a large Pawnee village. Alerted, the Pawnee immediately surrendered. Without bloodshed, the Pawnee War of 1859 was ended. It had begun July 1st, when messengers arrived at Omaha, the territorial capital, reporting numerous depredations by Pawnee against Elk Horn Valley settlers. If the Pawnee were to be punished, immediate action was necessary. Only the Governor could call out the militia, however, and Governor Samuel Black was a day's journey away. Petitioned by Omaha citizens, Territorial Secretary J. Sterling Morton assumed the responsibility and issued the call. Thayer with forty men left immediately in pursuit. A few days later he was joined by Governor Black with more volunteers and Lieutenant Robertson with Co. K of the 2nd U. S. Dragoons. 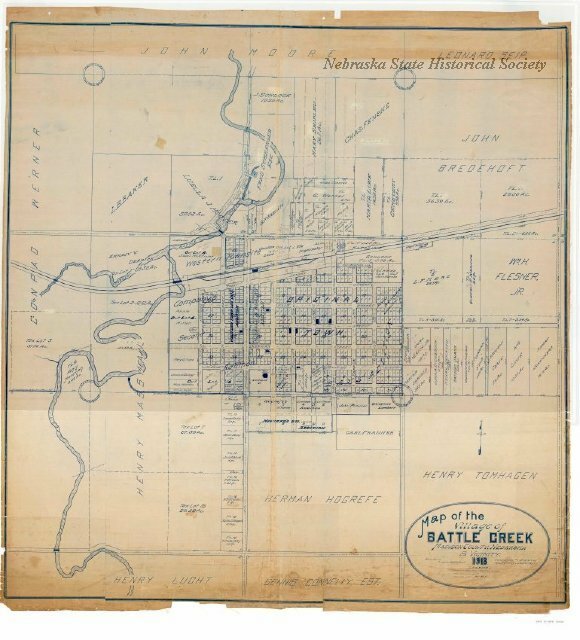 Though no battle occurred, the stream where the attack took place became known as Battle Creek, and the nearby town took the same name when founded in 1867. “Battle Creek,” Explore Nebraska History, accessed April 19, 2019, https://mynehistory.com/items/show/352.